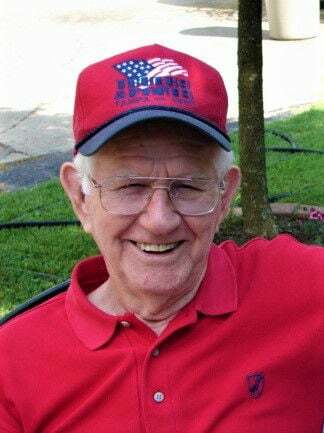 Carl Louis Harrington, 98, a resident of Sears Manor Nursing Home of Brunswick, Ga., ended his earthly journey on Friday, Jan. 11, 2019, and went to spend eternity in heaven with his Lord and Savior, Jesus Christ. Carl was born in Louisville, Ky., on Nov. 23, 1920, to Edgar Harrington and Sophia Gisler Harrington. His parents taught him early to honor the Lord, which he did throughout his long life. Carl was a loyal layman in the Church, a “good and faithful servant” to both Christ and others, and a man of faith and prayer. In other words, he was a true “man of God.” He grew up attending Atwood Wesleyan (Methodist) Church, Louisville, Ky., and kept his membership there for most of his life. At the time of his death, he was a member of First Wesleyan Church, Brunswick, Ga.
After the war, Carl and Eleanor started their family by welcoming their first child, Carl Daniel Harrington, in 1946. Their second son, Philip Alan Harrington, was born in 1951. Prior to his retirement, Carl’s major employers were American Standard Company and Durkee’s Famous Foods, both in Louisville, Ky. At the latter, he worked in maintenance and welding. As a young man, Carl excelled in baseball and was once scouted by the St. Louis Cardinals. He chose not to pursue professional baseball, because he did not want to play on Sundays – “the Lord’s Day.” He played church league softball and kept up with younger players until he was about 70. Carl also loved to play golf and had what was called a “sweet swing.” For many years, he played in the employees’ league at Durkee’s Famous Foods. He continued to enjoy golf with friends until arthritis forced him to stop in his mid-80s. Carl was preceded in death by his parents, Edgar and Sophia G. Harrington; his wife, Eleanor R. Harrington; his eldest son, Carl “Dan” Harrington; and all his siblings, Arlene Bailey Skaggs, Anna Mae Hibbett, James E. “Bud” Harrington, Vandora I. “Dodie” Keen, Naomi Ruth McCall and Charles M. Harrington. Carl is survived by his daughter-in-law, Donna Harrington (wife of “Dan” Harrington) of Salem, Ind. ; his son, Phil A. (Vonda) Harrington of Brunswick, Ga.; three grandsons, Jeffrey (Michelle) Harrington (son of “Dan” Harrington) of Miami, Fla., Phil E. (Loretta) Harrington of Bessemer City, N.C., and David A. (Kimberly) Harrington of Macon, Ga. (sons of Phil and Vonda Harrington); eight great-grandchildren; one sister-in-law, Norma Shirley R. Franke of Macomb, Ill.; several nieces and nephews; and other extended family. A celebration of life service will be held at 3 p.m. Sunday, Feb. 17, at First Wesleyan Church, 2307 Ellis St., in Brunswick, Ga. The family will welcome visitors beginning at 2 p.m.
A second celebration of life service will be held at 11 a.m. Friday, April 5, at Embry-Bosse Funeral Home Chapel, 2723 Preston Highway, in Louisville, Ky. The family will welcome visitors beginning at 10 a.m.
Entombment will be at 1 p.m. Friday, April 5 in the Normandy Chapel building of the Evergreen Cemetery Garden Mausoleum, 4623 Preston Highway. The family is deeply grateful for the outstanding end-of-life care Carl received at Sears Manor Coastal Nursing & Rehab and from Hospice of the Golden Isles, both of Brunswick, Ga. Cremation services were provided by Brunswick Memorial Park Golden Isles Cremation Center. The family requests that, in lieu of flowers that fade, memorial gifts be designated for the “Wesleyan JESUS Film Partnership” and sent to Global Partners, P.O. Box 50434, Indianapolis, IN 46250.